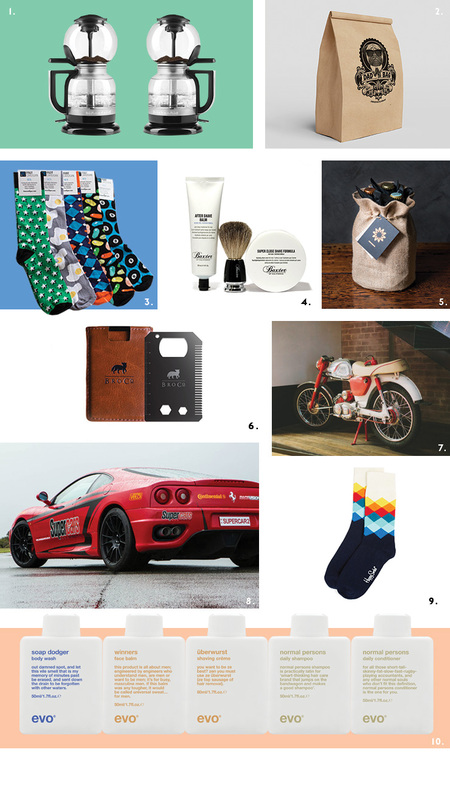 Since we know you would prefer to buy dad a Fathers’ Day gift from the comfort of your couch and jimmy jams, we’ve put together a list of the best presents you can buy dad, and they’re all available online. Win! Practical dads, lazy dads and thirsty dads will be well looked after this Father’s Day if you stick to the plan and buy him a little somethin’ somethin’ from this list. Perfectly brewed coffee without any of the hard work is on the cards when you buy dad the Craft Coffee Siphon Brewer by KitchenAid this Fathers' Day. We’re going to go ahead and assume that this is just as much a gift for you as it is for dad while we explain that this beauty delivers the perfect cup, while removing the need for a kettle or fancy equipment through precise temperature and vacuum technology. Plus, you can pop it on before you hop in the shower and be greeted with delicious coffee when you hop out. Win! For all of dad’s favourite things in one place, The Dad Bag is ideal for a hungry dad, with a taste for the finer things in life. Included in the bag, which will set you back an easy $45, is Chrissy’s Cuts artisan pork shoulder, maple syrup and bacon sausages, Handsome Devils Co. chipotle sauce and a choice of craft beer from dad’s favourite local brewery. They had us at bacon sausages, to be fair. For all of the information on how to get your hands on The Dad Bag, head here. Don’t make the mistake of assuming that these are just your average socks, because Foot Cardigans are just as cosy as you would expect, with delightful patterns that suit dorky and cool dads alike. They’re full of sass, so we instantly love them and since sock subscriptions are their thing, this is the gift that’ll keep on giving. They promise that you (and your dad) will love every single sock delivered, so you can’t really go wrong. This one sits in the ‘things dad can’t justify spending money on for himself’ basket, which is exactly why it makes the Shave 123 Kit by Baxter California the perfect dad’s day present. As the name suggests, this kit includes the three crucial ingredients for the perfect at-home shave; the best badger shave brush, super close shave formula and the cooling and calming after shave balm to finish up. Because after all, he’s worth it. Featuring an always-changing selection of Australian craft brews, Brewquets is the beer lovers equivalent of a bunch of roses. They change their selection every week, but have been known to feature the likes of White Rabbit, Stone and Wood and Two Birds. You won’t be overwhelmed with choices, because there is only one at any given time. But you’re always guaranteed three bottles of brew, nestled in a hessian bag. For a practical dad, who appreciates a multi-function item, buy the Swiss army knife of wallets for him this Fathers' Day. On the outside, it just looks like your average bicast leather wallet, with a pocket for your cards and elastic straps for all of the cash, but it’s the removable BroCard that holds most of the fun. The titanium multi-tool card is lightweight and has many the function, with a built-in bottle opener, hair and beard comb, ruler, three screwdrivers on the corners, two hex wrenches and a 2-grade file on the back. Yes, really. If your dad loves his motorcycle almost as much as he loves you (or more), then a membership gift certificate for Rising Sun Workshop will be right up his alley. The voucher will give them a full year’s membership to the workshop and access to all of the available tools and work bays, parts delivery and holding and a discounted rate to all of their workshops. And because we’ve got all of the best hook ups, enter the code: urbanlistrswdad2016 at the checkout to receive 20% off. You’re welcome. A voucher at Red Balloon is the ideal way to treat your dad, without having to make any of the difficult decisions about what to actually buy the guy, since the voucher will give him access to their full spectrum of adrenaline pumping activities, depending on how generous you’re feeling. Think rally driving experiences and skydiving, for starters. Go on, buy a double pass while you’re at it and make it a bonding day with dad. A classic Father’s Day gift with a quirky twist is exactly what you’ll get when you buy dad a pair (or three) of these patterned socks by Happy Socks. There are more options than is surely necessary for the humble sock, but if you’re sick of buying dad the tired old monochrome socks this year, then they are definitely worth the splurge. Keep those luxe vibes going and treat your dad to the all-in-one Coalition for the Groomed kit by evo hair. The kit has five essential products that’ll leave your dad feeling well spoilt, including the normal person’s shampoo and conditioner, überwurst shaving crème, winners face balm and the soap dodger. This Fathers’ Day, Beer Days have put together a limited edition book and beer combo because of course he needs a little bit of light reading to accompany his beer sipping, right? You can cater the combo to your dad’s taste in books, because these guys have one for the football, the surfing, the food or the music-loving dad. On the beer front, there will be a selection of limited release craft beers in your box. If you are feeling generous and want all of your bases covered, upgrade your box to include more beers and food. Looking for somewhere to take dad this Fathers' Day? We've got a list for that.